Pedal for Kids is one of the Montreal Children’s Hospital Foundation’s most important fundraising activities. It’s also one of the most exciting! Imagine a 30-seat Mighty Bike powered by proud participants making its way through the city’s downtown streets to rousing music! In 1992, Sylvie Lalumière and Michael Conway started Pedal for Kids in memory of their daughter Meagan who had been treated at the Montreal Children’s Hospital. Twenty-six years later, their initiative is going strong, helping the hospital in its mission to provide cutting-edge care for sick children and their families. Les fonds amassés vont au Fonds pour la santé des enfants pour répondre aux besoins les plus urgents de l’hôpital, notamment pour l’achat d’équipement médical et chirurgical et pour le financement de projets innovateurs. Et iront à d’autres priorités importantes qui dépendent de l’argent recueilli par la Fondation. Votre contribution est essentielle au succès de l’Hôpital de Montréal pour enfants comme chef de file mondial des soins pédiatriques. Lorsque vous faites un don pour ses besoins les plus urgents, vous aidez à offrir les meilleurs soins possible à d’innombrables patients et à leurs familles. Pedal for Kids is much more than a fundraising event. It’s a turnkey team-building activity for your company in the heart of Montreal. Once you've collected the amount, all you have to do is hop on our Mighty Bike. No need to be athletic; you simply have to know how to pedal. 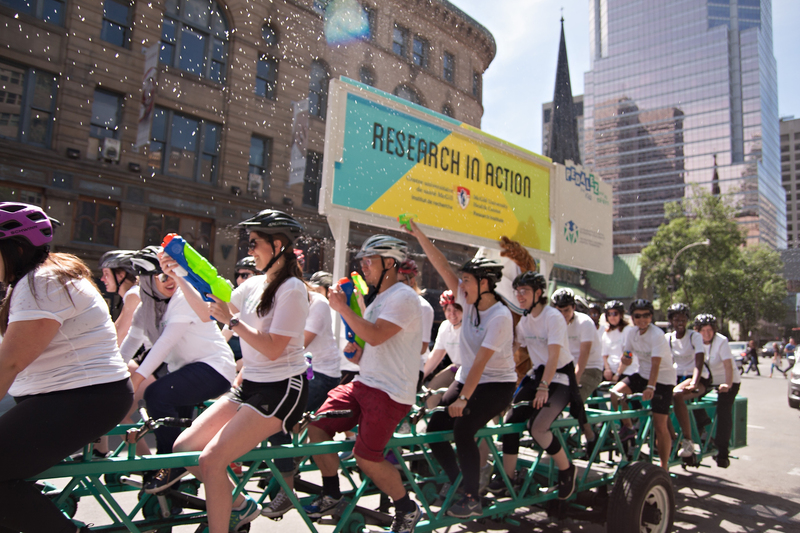 In a dynamic atmosphere, you’ll celebrate your fundraising success by biking through the main streets of downtown . . . Put on your helmet—it’s going to get noisy! Be imaginative: Invent a rally cry, compose a song, bring along a mascot . . . Any idea (well, almost any) is allowed as long as you’re having fun. We’re certain it’ll be an experience you’ll never forget! What is Pedal for Kids? A fundraising challenge for corporate and community teams whose efforts are rewarded with a fun-filled ride on the Mighty Bike. What is the Mighty Bike? A custom-made bicycle built for 30 people. Raise a minimum of $500 in donations, and you will earn your seat on the Mighty Bike! How long is the ride on the Mighty Bike? The ride lasts approximately 30 minutes. You should arrive at least 20 minutes before the start of your ride and stay for 10 minutes after your ride for pictures. You should expect the activity to last approximately 1 hour total. What do I need to bring for my ride? Dress comfortably, in clothes that can get wet, since water guns are used during the ride! Athletic clothing is optional. We will supply helmets (mandatory), water and snacks. Teams are encouraged to personalize their look with custom helmet covers, t-shirts, or anything to identify as a group. Be creative! Do I need to be physically fit to ride the Mighty Bike? Not necessarily, but you should be capable of pedaling on a bicycle for 30 minutes at low- to medium-intensity on flat terrain. Powering the bike is a team effort, so you won’t be pedaling alone! What happens if it’s raining on the day of my ride? Rides take place RAIN or SHINE! Waterproof ponchos that fit over your clothing will be provided in case of inclement weather. What kind of visibility does my team receive? Teams of 15 or 30 riders have the option of displaying a large banner on the Mighty Bike during their ride. Teams will also receive visibility on the website, on-site at the event, and on Facebook. Who can participate in Pedal for Kids? Anyone who wants to help improve the care provided to sick children. Is there a minimum age or height requirement? There is no minimum age to participate, but riders need to be at least 5’2’’ in height in order to reach the pedals on the Mighty Bike. Contact Camille Lareau at clar@mchf.com or 514-934-4846 ext.29270 to register your team. Go on your team’s page, and click on “Join this team”. Follow the steps to create your fundraising page. How can I participate if I do not have a team? You have two choices: you can create a new team, or you can join our spokeschild ride as a solo rider. In order to do so, contact Camille Lareau at clar@mchf.com or 514-934-4846 ext.29270. The deadline to register a new team is May 1, 2019. The deadline to register a new rider is June 1, 2019. What do I do if I miss the registration deadline? Contact Camille Lareau at clar@mchf.com or 514-934-4846 ext.29270 to know if places are still available. What is the minimum number of riders for the Mighty Bike? There are 30 seats on the bike, but it can be moved with minimum 25 riders. They’ll just have to pedal harder! Can I register more than one team? Yes, as long as the objective for each team remains a minimum of $500 per person. Do I have to raise funds to participate in Pedal for Kids? Yes, if you want to ride on the Mighty Bike! Is there a minimum fundraising objective for each participant? The minimum objective is $500 per person. Check out our tips section to get started! Is there a minimum fundraising objective for a team? The minimum objective is $15,000 for a full team (30 riders) and $7,500 for a half team (15 riders). Returning teams are encouraged to beat their previous total – we believe you can do it! How will the foundation help me to raise funds? We provide you with an arsenal of solicitation tools: your own personal fundraising page, email templates, patient stories, pledge forms, and ideas for organizing your own fundraising activity. Check out our tips section to get started now! What happens if I don’t complete my fundraising objective before my ride? We encourage everyone to complete their fundraising on or before the day of their ride. However, you can continue to collect donations up until August 31, 2019. How do I create a personalized fundraising page? How do I share my fundraising page with my contacts? Once your page is active, you can copy the link into an email or share the page with your Facebook friends and LinkedIn contacts. How do I support a participant or a team? At the bottom of this page, select the team of your choice. You’ll find the team members list on the right. Click on the rider you want to support and you’ll be able to make a donation on his page using the options on the right. If you don’t know the rider’s team name, you can use the search bar at the top right of the website to look for the person of your choice. Select his page within the search results, and you’ll be able to make a donation on his page using the options on the right. Do donors receive a full tax receipt for their donations? Yes! 100% of donations over $15 are eligible for official tax receipts. If they make their donation online by credit card, they will receive an email with their tax receipt attached within 24 hours. If they send their donation by cheque, it will take between 6-8 weeks to receive their tax receipt by mail. Yes! In fact, it is our preferred method since the processing time is much faster than for cash or cheque donations. What do I do if someone wants to donate by cheque? Encourage them to make their pledge on your personal fundraising page, where they can write a personal message of encouragement on your wall. The online donation payment page includes the option of donating by cheque. The cheque can be mailed directly to the foundation along with the name, address, and team name; alternatively, the cheque can be given to your team captain. What do I do if someone wants to donate cash? The best way to handle cash is to put it in a sealed donation envelope (provided to all participants) along with the name and address of the donor, and give it to your team captain. You can also drop it off directly at the foundation to the attention of Camille Lareau. Make sure that you indicate the name of your team on the envelope so we know to whom to attribute the donations! How can I get involved in Pedal for Kids without fundraising? Become a volunteer! Over 30 individuals help out every day on the Pedal for Kids site. Contact Camille Lareau at clar@mchf.com or 514-934-4846 ext.29270 for more information and to sign up as a volunteer. I want to become a sponsor of the event. How do I proceed? There are many sponsorship opportunities available for both big and small companies. Contact Angela Vahaviolos, Director of Corporate Giving at 514-934-4846 ext. 29210. Thank you to our longstanding partners who have raised impressive amounts for the Children’s by rallying their networks to support Pedal for Kids.